People. We’re not talking about gum here. 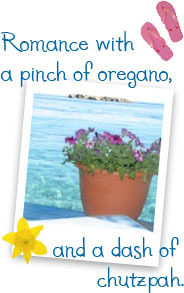 I’m sharing this in honor of the launch of a new group blog I’m part of over at the Chick Lit Writers of the World site. We’re talking about the state of chick lit, and how the genre is SO not dead, so I thought it was only fair talk about why I write it. The personal, touching story of how I started writing chick lit. I was supposed to be living in New York. I had been, for over two years, and at the time, Manhattan was the only place I could imagine living. The rest of the world had nothing for the twenty-seven year old, fresh out of grad school and ready to take the world by storm me. But my heyday was over. The tiny studio I was cramped into (and by tiny I mean it basically had room for my twin bed, a desk, and me, and not enough room for the mice who liked to come visit) was losing its charm. My shiny, new degree from Columbia was proving about as useful to my job search as my certificates from camp. And I’d had surgery that hadn’t gone quite as smoothly as planned. So I went back to California, back to my teaching job, with a principal the district must have found somewhere deep within the seventh layer of hell. There was no question that I was going back to New York at the end of the school year. Twenty-seven year olds aren’t supposed to live with their mothers and have the exact same job they had at the age of twenty-two. That year is one of my biggest regrets. So one miserable, boring, stifling night I got in the car to take part in an activity that worried my mother sick. I “went driving.” She hated when I did that. Aimless driving, no purpose, in the dark. But off I went. I ended up at Barnes and Noble, and suddenly, I just had to have a book with a pink cover. Something I could read in just a few sittings. Something to cheer me up. 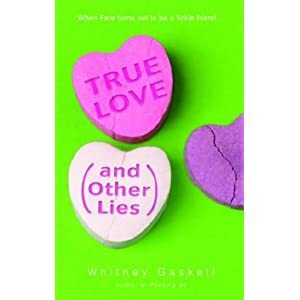 True Love (and Other Lies) by Whitney Gaskell. It wasn’t pink, but it was close enough. And I devoured it, along with Pushing Thirty. It’s not surprising. Her books were about women going through the same things I was going through, and there was an adorable pug to boot. This really wasn’t that long ago, but author Web sites were still pretty new. But Whitney Gaskell had a site listed in the back of her book. And she had a blog! She was the first author I ever emailed, and she’d always write back, especially to talk about dogs. And then, soon after, she announced that she was going to be one of the Literary Chicks (sadly, their site is no longer up). I followed Whitney over to the first group blog I ever read, where I discovered other chick lit writers, including Alesia Holliday, Michelle Cunnah, Eileen Rendahl, Beth Kendrick and Lani Diane Rich. I was there every single day, loving the feel and the voice of their posts, not to mention the wonderful community. I went into mourning when they stopped blogging. But then I learned something about Lani. When one of her incredible projects, like the Literacy Chicks blog, ends, another starts soon after, and results in a large, close knit, supportive community. And Lani’s next project was “Will Write for Wine,” a podcast about wine and writing. I wasn’t a wine drinker (then – ha!) or a writer, but hey, it was Lani, so I was there. She did the podcast with Samantha Graves aka CJ Barry (who writes science fiction and paranormal and is such a master storyteller – she’s one of the few authors who can pull me away from contemporary women’s fiction). I wrote about what happened in more detail here, but long story short, I listened to the first few episodes, thought, “Huh. This writing thing sounds cool.” And now, I’ve got three manuscripts under my belt. All are romance, two of those would be considered chick lit. The thing is, if I say the words “chick lit,” I get my hand slapped. I even tried to rewrite my first book to make it more of a romance, by my heart broke because although the romance was a huge part of the story, the story I was trying to tell was about the protagonist and how she was dealing with “adult onset growing pains,” just like I was. My dream is that someday, people will ready my stories, identify with the characters and their struggles, feel a little less alone and come away with a sense of hope. There was a time when chick lit was all about pink covers, lipstick, and shoes. In some cases, it still is, and there’s nothing wrong with that. But I love that these days, a chick lit heroine can wear stilettos, bunny slippers or work boots. She may be the life of the party, or feel more at home curled up on her couch with her dog. She can work in an office or a national park. What makes her a heroine is her attitude, her strength, and that we laugh with her, cry with her and follow her through whatever type of journey she may be on. Chick lit may be hard to sell these days. But it’s being read. And it’s still being written. There was a time when chick lit was all the rage, probably for the reasons I stated above. I assure you. The genre isn’t dead. And we over at Chick Lit Writers of the World are setting out to prove that. I have no doubt that your stories will be read and enjoyed and will most certainly inspire someone just the way Whitney Gaskell inspired you. I also know that what comes around goes around. The genre isn’t dead, it’s just laying low, building steam for it’s next big attack. Does this mean you’ll be popping up there regularly? Hooray for you, Melina! Let your chick lit flag fly, and fly proudly!! !